WizKids is showing off Mr. 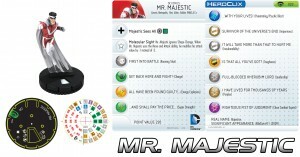 Majestic for the upcoming Superman set for HeroClix. Today we go to Metropolis and there is a new man in town. In the upcoming DC HeroClix: Superman and the Legion of Super-Heroes set we will be visited by a true prince. Mr. Majestic is believed to be one of the most powerful of all the Kherubim Lords and has been known to aid the WildC.A.T.s in their ongoing battle with the Daemonites.